Family, friends and fans have paid tribute to James Gandolfini at his funeral in New York City, a week after he died in Italy. David Chase, who created The Sopranos series that made James Gandolfini a household name was among the speakers. “You were a good boy,” he said during the ceremony at New York’s Cathedral Church of Saint John the Divine. James Gandolfini, who was 51, died following a heart attack last Wednesday while on holiday with his son. 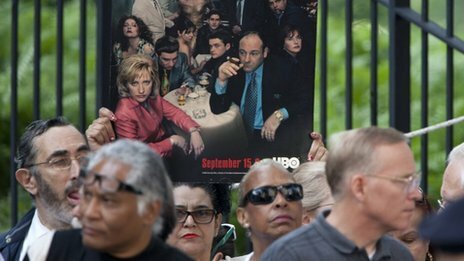 One of four speakers at the funeral, David Chase remembered James Gandolfini in the form of a letter to the actor, in the present tense, saying he brought the traits of a sad boy, “amazed and confused,” to the role of Tony Soprano. David Chase said he marveled upon hearing that, since the actor represented a man so many others wanted to be. James Gandolfini’s widow, Deborah Lin, and two family friends also spoke during the service. The actor’s portrayal of the mob boss in the HBO series won him three Emmy Awards as best actor in a drama series. The show ran for six seasons. Aida Turturro, who played James Gandolfini’s sister in The Sopranos, was one of the first from the show’s large cast to arrive for the funeral service at 10:00 EST, which was led by the Very Reverend Dr. James A Kowalski. Some 1,500 seats had been set up in the church for celebrities, fellow actors and members of the public who wanted to pay their respects to the star. Several members of the cast of The Sopranos attended, including Edie Falco, Joe Pantoliano, Dominic Chianese, and Steve Buscemi. The New Jersey Governor, Chris Christie also made an appearance. Laila Robins, who played James Gandolfini’s on-screen mother as a young woman in the early seasons, remembered his friendly and humble nature. “He had an acting coach on set back then because he just wanted to do a good job. That was so sweet, and I remember that about him the most – just how badly he wanted to do a good job. He worked so hard,” she said. The funeral took place a day after a private family wake was held in New Jersey on Wednesday. Broadway theatres later paid tribute to James Gandolfini, who was nominated for a Tony Award in 2009 for his role in God of Carnage, by dimming their lights.